Today is Equal Pay Day, which each year highlights the continuing disparity between men’s and women’s earnings. This disparity, commonly known as the ‘wage gap‘, shows just how far we still have to go to achieve gender equity. Despite making modest gains in hourly earnings, women earn less than men in every sector of the economy, and at every age. 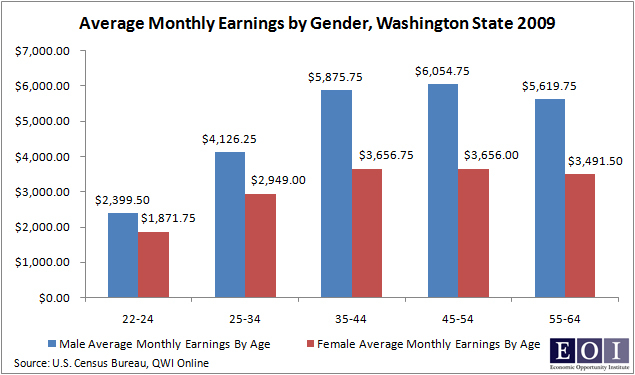 From 1990 to 2009, Washington women’s average monthly earnings compared to men’s actually declined from 68% to 63%. In 2009, Washington women on average made $1,815 per month less than men. As Ellen Bravo points out in a recent article, some argue that the wage gap exists because women – who bear the primary responsibility for providing care to children and older parents – trade income for flexibility. But there’s a flaw in this argument: typically, the lowest paying jobs have the least flexibility – and no paid sick days to cover illnesses or emergencies. Forward progress for women in the workforce has largely stalled over the past two decades becauseÂ workplace standards remain mired in outdated assumptions that most workers are men and most families have a full-time caregiver at home. Among Washington’s private sector workforce in 2009, just 41% of firms offered paid sick leave to full time employees, and just 14% offered the benefit to part-time employees. A critical piece of the pay equity puzzle includes employer recognition of changing family structures. Now more than ever, families rely on two incomes to get by – and women’s earnings are critical to family economic security. But employer practices and benefits often to don’t recognize these changes – and penalize female employees for taking time away from work for maternity leave, to care for sick children, or provide care for an elderly relative. New legislation that enforces modern workplace standards, protects family care giving roles, and supports early learning and care is needed for women to make the next leap toward gender equality. Without reliable access to paid family leave, paid sick days, and affordable, quality childcare and preschool, career opportunities and earning potential will continue to be limited for the majority of women. Our children, families, businesses, and communities all pay the price for our failure to step up to the public policy needs of today’s working women. This entry was posted in Family values, Paid sick days and tagged equal pay, inequality, Wage, wage gap. Bookmark the permalink.